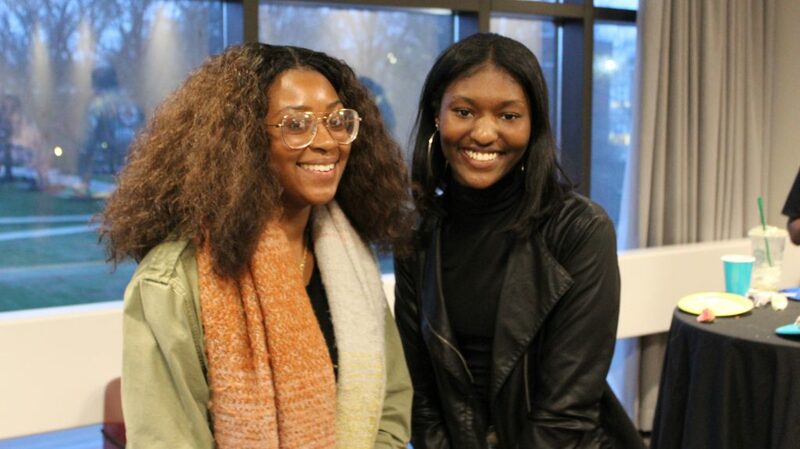 Freshman public relations major Alexis Plummer and freshman communications major Rikiyah Mixson at the Tapesry event on April 11. In a celebration of blended cultures, the launch of a new online opinion-editorial (op-ed) publication brought various students, faculty and staff together on April 11. Tapestry is an initiative by the Department of Communication and Journalism designed “to engaged Rider students in unique media learning and teaching opportunities, including filmmaking, journalistically impactful reporting and community educational presentations that foster reflection of the cultural and life experiences of underrepresented populations,” according to its mission statement. Tapestry has now released “Perspective Z,” a play-on words of Generation Z (Gen Z), on April 16. Gen Z was the newest generation to be named and was composed of those born between 1995 and 2015. The publication showcases eight articles written by Gen-Z students, Dean of the College of Liberal Arts and Sciences Jonathan Millen and Carroll. Qur’an Hansford, sophomore journalism major and editor-in-chief of “Perspective Z,” wrote “Oh, Black Child,” an article about real accounts and effects of whoopings in African-American households, for the publication. When asked what the most rewarding part of working on “Perspective Z,” Hansford reflected on the impact of her fellow Tapestry members. Tatyanna Carman, sophomore journalism major and managing editor of “Perspective Z,” wrote “Anxiety Through Generations” for the publication. Carroll beamed with pride when she talked about the club’s members and their work on the new digital publication. Carroll, in “Openings,” wrote, “It is our hope, that through “Perspective Z,” Tapestry students will positively open the lines of communication that encourage enlightenment, adult debate and new understanding. Editor’s note: In addition to their roles with Tapestry, Qur’an Hansford and Tatyanna Carman are editors at The Rider News. They were not involved in the editing of this article.